Bearbind (Convolvulus Sepium) other names : Bearbind , Bindweed , Hedge Bind Weed , Old Man's Nightcap . 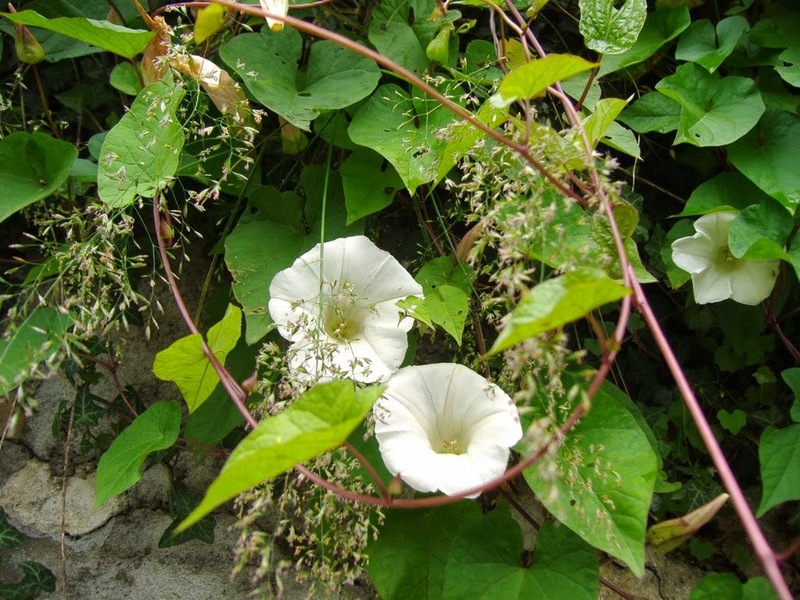 Bearbind (Convolvulus Sepium) is a perennially growing herb-like plant having climbing and spiraling stems that bear alternative leaves. This plant produces white or light pink blooms with white streaks and shaped like trumpets. The flowers appear during the period of July and September and similar to all the other species of this genus, develop while there is sunlight and stay closed when the weather conditions are gloomy. However, unlike the blooms of the Field Convolvulus, bearbind flowers do not close when it is raining. The seeds of this herb are like capsules. Bearbind has a chunky tubercle root that forms at the base of the stem and goes to sleep during the fall to remain underground all through the winter months. Bearbind has the ability to grow in any place, but bearbind requires support from taller trees, trellises or hedges. The scientific name of bearbind is derived from the Latin terms ‘convolvere', which when translated into English denotes ‘to entwine', and ‘sepes' meaning ‘a hedge'. 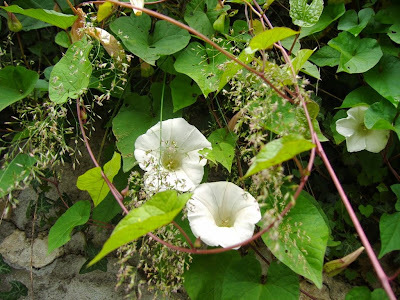 In fact, the botanical name of bearbind suggests the manner in which this plant, also known as hedge bindweed, grows. Wherever this herb grows, such as in thickets or hedges, bearbind has the aptitude to twine itself with its spirals and generally it counters clockwise in a roundabout fashion on any neighboring plant or a fence for support. In the form of a therapeutic herb, bearbind has been held in high esteem for the potent purgative of its leaves, roots and stems of the herb. In addition, in folk medicine, this herb was also used to cure jaundice. Bearbind is a close relative of the common morning glory (Ipomoea purpurea) and is among the most widespread weeds found in North America. At the same time, bearbind is also among the most attractive weeds in the region. However, gardeners are not in favour of bearbind, as it strangulates the plants growing in its neighbourhood, while the plant massive root system causes soil depletion. 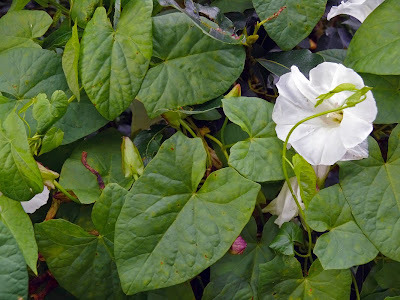 It may be noted that bearbind is simply a member of a vast plant family, which also comprises sea bindweed, field bindweed, Syrian bindweed (also called scammony) and jalap bindweed (found in Mexico as well as South America). To some extent, these plants posses a similar cathartic attributes and they also possess other properties, which are common to all. All plants in this family produce beautiful flowers resembling the shape of a trumpet and whose hue varies from white in the case of bearbind, red-stripped rose in the instance of sea bindweed, and sulphur-yellow of scammony. In addition, there is another common aspect of the flowers of these plants - they all remain closed on gloomy days when there is no sunshine or sunlight. Bearbind is a very adaptable plant, which can be grown very easily. The plant has a preference of total to partial sunlight and humid to mesic (moderate moisture in the air) climatic conditions. Bearbind has the aptitude to endure inferior soil and is generally found prospering in gravel or rocky areas. Bearbind can readily climb fences, trellis as well neighbouring plants and when grown in open areas, this species spreads out randomly throughout the ground. The ability of the herb to climb is primarily owing to its stems coiling firmly around any slender object. Bearbind has the ability to extend assertively and often turns out to be an annoyance in some areas. Bearbind can be grown without any difficulty in common garden soils and in a sunlit location. However, plants of this species have an inclination to turn out to be invasive. In effect, hedge bindweed is a very bothersome garden weed, particularly when grown on damp soils. Bearbind is also a robust climber having annual shoots that are about three meters or even more in length. These plants coil around other taller plant and may even kill them by repressing or choking them. When these plants become established, it is extremely problematic to get rid of them since they have very deep roots and are competent to re-grow from any portion of the root that might be left underground. Bearbind possesses a number of therapeutic properties and is, hence, used to treat a variety of health conditions. The dehydrated rhizome or underground stems of bearbind, roots as well as the leaves have been employed to prepare purgatives and medications to treat problems related to the gallbladder. The fleshy root of this herb possesses diuretic, demulcent and febrifuge attributes and can be used in the form of a poultice. In addition, the bearbind root is also a potent laxative. It is believed that using formulations prepared from the root internally promotes the flow of bile. In effect, this herb is basically employed in the form of a purgative, but it also aids in diminishing inflammation of the mucus membranes, in addition to reducing fevers. The powdered form of the dried out root of bearbind or a decoction prepared from the whole herb is employed for treating the conditions mentioned above. A fresh juice extracted from the leaves of bearbind ought to be taken only in small amounts, for taking it in large quantities may result in constipation. Similar to all other potent purgatives, bearbind is not meant for prolonged use. Some parts of bearbind are edible. For instance, the stalks and roots of the herb are consumed after cooking. They are also cleaned and steamed prior to consumption. This herb is highly nutritious as it has rich contents of starch and sugars. However, this herb should not be consumed on a regular basis since it may have a laxative effect. The tender shoots of bearbind are also edible after cooking. However, people consuming any part of this herb should exercise some amount of caution, as this may probably have a laxative effect. People who intend to use any formulation of bearbind should exercise a number of precautions for taking it in excessive dosage may result in constipation and other ailments. People who are enduring stomach ache, problems related to the intestine, for instance, appendicitis, obstruction, Crohn's disease, colitis or irritable bowel syndrome (IBS) should avoid using this herb. In addition, this herbal medicine should never be given to women during pregnancy or breast-feeding mothers.